In the post A Box of Chocolates, I explained writing stories of Western District pioneers and Hamilton’s WW1 servicemen is like lifting the lid on a box of chocolates…I never know what I’m going to get. Writing this month’s Passing of the Pioneers was like dipping into a double layer box of chocolates. 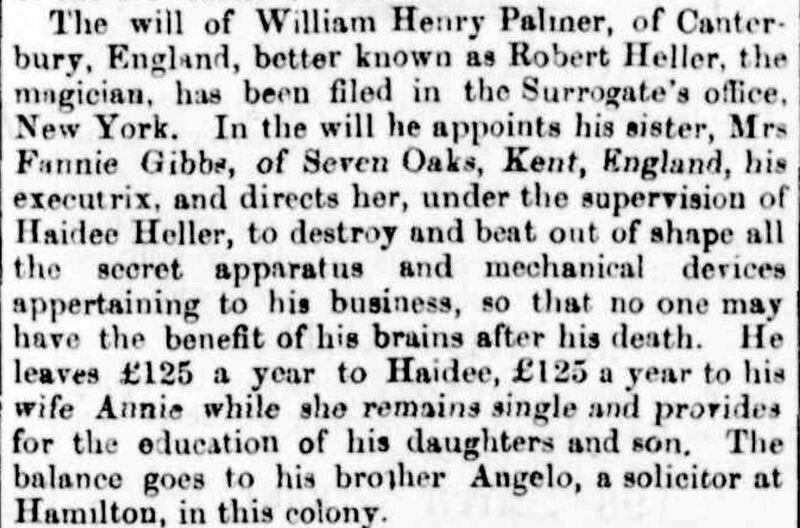 I’ve read many editions of the Hamilton Spectator and histories of Hamilton, so I knew of Angelo Palmer, a prominent solicitor in the town, but I’d never delved into Angelo’s life. When I read his obituary for this post, I got two surprises. Firstly he was a passenger on a clipper shipwrecked off Victoria’s south-west coast of interest to me because the clipper’s colourful captain also steered my ggg grandparents Charles and Agnes Hadden to Australia aboard the Marco Polo. Secondly, there was something “magical” about Angelo but you’ll have to read on. Other pioneers in this edition, combining August and September obituaries, include a Hamilton chemist described as the “poor man’s friend” and from the Darlington district, a man, his son and his son’s wife. Click on any underlined text throughout the post for further information. McARTHUR, Peter – Died 3 July 1897 at Camperdown. Peter McArthur was born to well-off farmers on the island of Islay, off Scotland’s west coast, around 1817. As a lad, he joined a ship’s crew and left home for a couple of years before returning to his father’s farm. But in 1836 at the age of nineteen, he was off again with Sydney, Australia was his destination. By 1839, he had moved south to Melbourne, meeting up with a man who would also become one of the Western District’s notable pioneer, Nicholas Cole. They met Frenchman Jean Duvarney and the three men made their way to Geelong, buying a flock of sheep from the Manifold brothers. With their sheep, the three men headed further west and took up land north of Camperdown. Duvarney left the partnership going on to build the Duverney Inn, later known as the Frenchman’s Inn, at the junction of the busy roads from Melbourne and Geelong to Port Fairy and Portland. In 1852 at that place, the township of Cressy was gazetted, named after Duverney’s hometown Crecy in France. Around 1850, Peter and Nicolas Cole split their station and Peter named his share Meningoort and Cole, West Cloven Hills. In 1855, Peter married Margaret McLean about eighteen years his junior and they went on to have ten children. 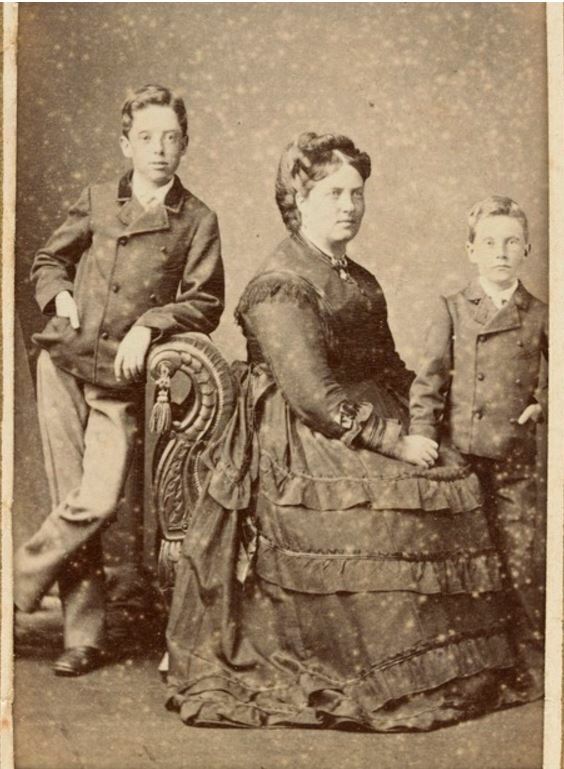 Margaret is pictured below with two of the couple’s sons. Peter was one of the first Magistrates in the area, a member of the district’s first Roads Board and a Hampden Shire Councillor. He was also a member of the Leura Lodge of Freemasons. Margaret McArthur died on 23 March 1883 at the age of forty-eight after a long illness. Peter by this time was around sixty-six with children as young as eight. He remarried in 1886 to Eliza Hood about thirty years his junior and they had a son. Peter died eleven years later at the age of eighty. He was buried at Camperdown Cemetery. He left his widow Eliza, seven sons and two daughters. Eliza died on 22 January 1926 aged seventy-nine. In 1941, The Australasian included Meningoort in their Famous Pastoral Properties series and you can read the article including more on Peter McArthur on the following link – The Australasian. 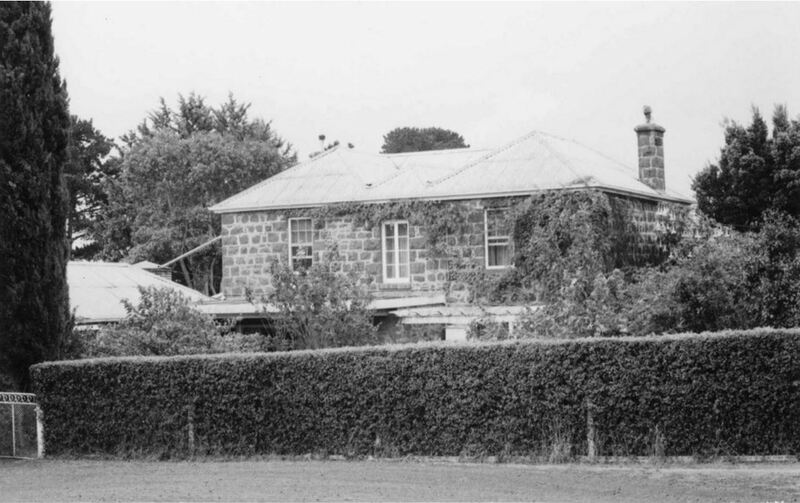 The McArthur and Cole families remained on the properties Meningoort and West Cloven Hills and in 2013, the Warrnambool Standard published an article about the two families still there over 170 years after their forebears arrived. That article is on the following link – Warrnambool Standard. 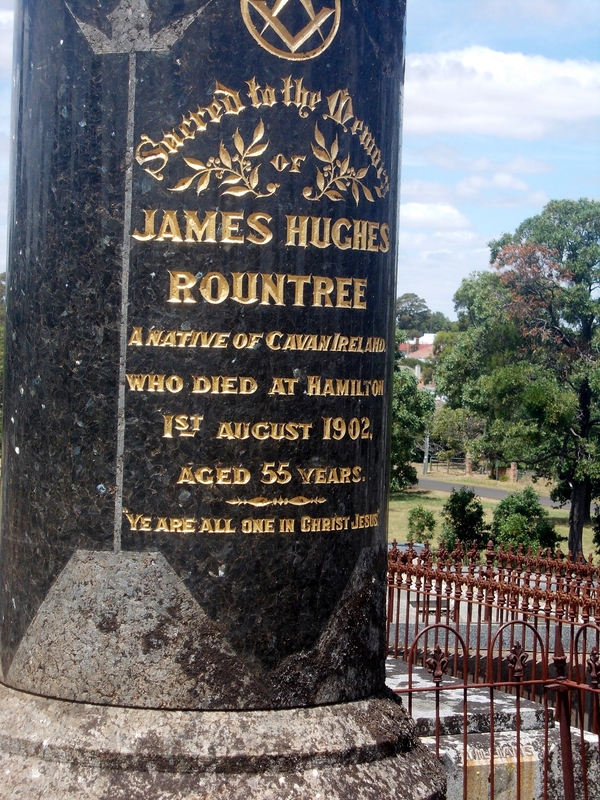 ROUNTREE, James Hughes – Died August 1902 at Hamilton. James Rountree was born around 1847 in Ireland, a son of an Irish Protestant father and a Welsh mother. He arrived in Victoria aboard Great Britain in 1864 and worked as a dispenser at the Geelong hospital. In 1874, he became superintendent of the Hamilton Hospital. 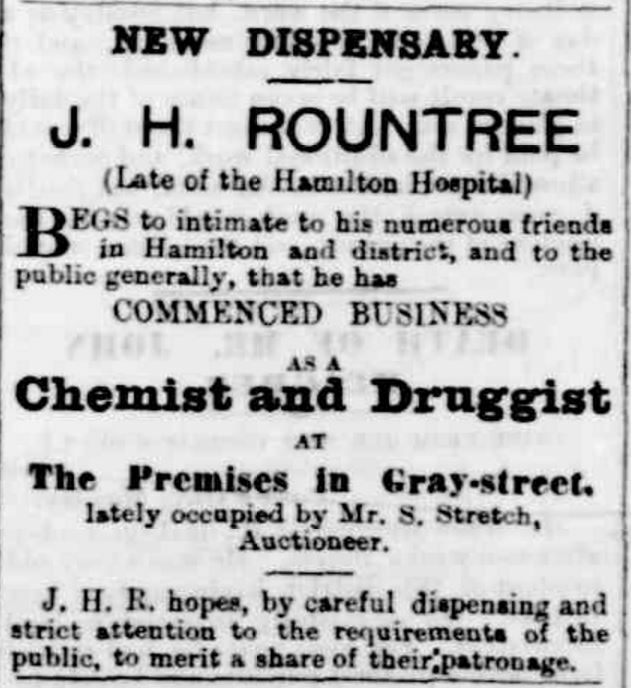 Fifteen years later, James opened a chemist in Hamilton’s Gray Street. “Advertising” Hamilton Spectator (Vic. : 1870 – 1918) 3 September 1889: <http://nla.gov.au/nla.news-article225760959&gt;. James was a man who “abhorred idleness”, never taking a holiday and going about everything he did with great energy. His commitment to his work meant he had little or no family life. Described as an unselfish and generous man, James often gave free advice to the less wealthy in the town, saving them a visit to a doctor. James became known as the “poor man’s friend”. In 1875, James married Margaret Strang Kitchen and they went on to have eight children. Most of James and Margaret’s children followed James’ profession. Daughters Mary, Margaret, Jean, and Ella were chemists as was son James. Mary Rountree married the well-known jockey Bobby Lewis in 1920. Lewis rode four Melbourne Cup winners during his career and controversially rode Phar Lap to third in the cup in 1929. Another daughter Evangeline served as a nurse during WW1. James’ strict work ethic appears to have claimed his life. He died at the Hamilton Hospital aged fifty-five. James was a member of the Masonic and Orange Lodges and thirty members of the Masonic Lodge led his funeral procession and the hearse was followed by twenty-one members of the Orange Lodge. James did not approve of flowers at funerals so predictably, flowers were not present at his own funeral by request of the family. PALMER, Angelo Crotch – Died August 1912 at Hamilton. Angelo Palmer was born in Faversham, Kent in 1832 and grew up in Canterbury where his father was a professor of music. Angelo and his brother William Henry attended boarding school from a young age. William inherited his father’s musical talent while Angelo was expected to join the legal profession. After his schooling, Angelo was articled to solicitors in London but with the discovery of gold in Victoria, he decided to leave England and seek his fortune. In 1852 at the age of twenty, he sailed aboard the South Sea, arriving in Victoria in February 1853. Angelo set off to Castlemaine but within months was back in Melbourne in search of work, finding a labouring job with a builder. Just as Angelo left England in 1852 so too his brother. William Palmer had gone on to study at the Royal Academy of Music in London but left his studies behind around 1851 after he saw a performance by French magician Jean-Eugène Robert-Houdin. Taking up magic, William changed his name to Robert Heller and travelled to the United States in 1852 where his career took off. With the death of his father in mid-1854, Angelo returned to England. Within a year, he booked his return passage to Australia aboard a clipper on her maiden voyage. On 6 October 1855, the Schomberg (below) left Liverpool captained by James Nicol ‘Bully’ Forbes and with cargo and 430 passengers, including Angelo. 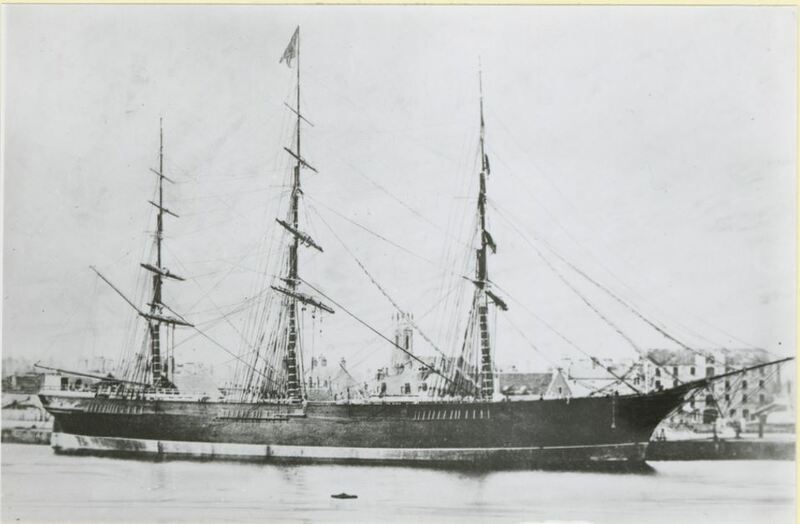 The Schomberg was one of the largest and finest clippers built and Forbes was out to break a record of the fastest trip to Victoria, something he had done with the Marco Polo in 1852. His target was sixty days his target. On Boxing Day 1855, the clipper ran aground on a sandbar near Curdies Inlet at Peterborough, Victoria. Fortunately, a passing steamer the SS Queen rescued all passengers and transported them through to Melbourne. There was an investigation into the wreck and while Captain Forbes was acquitted but his reputation was ruined. The Schomberg eventually sunk off the coast. Back in Melbourne, Angelo decided to return to law, qualifying as a solicitor in 1859. In 1860, he married Katherine Walker and a child, Fanny Dolby was born in 1861 at South Yarra. Another daughter was born in 1862 in Melbourne. In the same year, Angelo and family arrived in Hamilton and Angelo went into partnership with Henry Cox. Angelo and Kate’s first son, Saxon Harold, was born in 1864, but in 1866, their eldest daughter Fanny died. In 1873, the couple lost another daughter, one-year-old Hilda Victoria. By 1869, Angelo was working alone and his services highly sought after. He acted as solicitor for the Shires of Mount Rouse and Dundas and the Borough of Hamilton. He was also one of the original directors of Alexandra College and the Hamilton and Western District College. 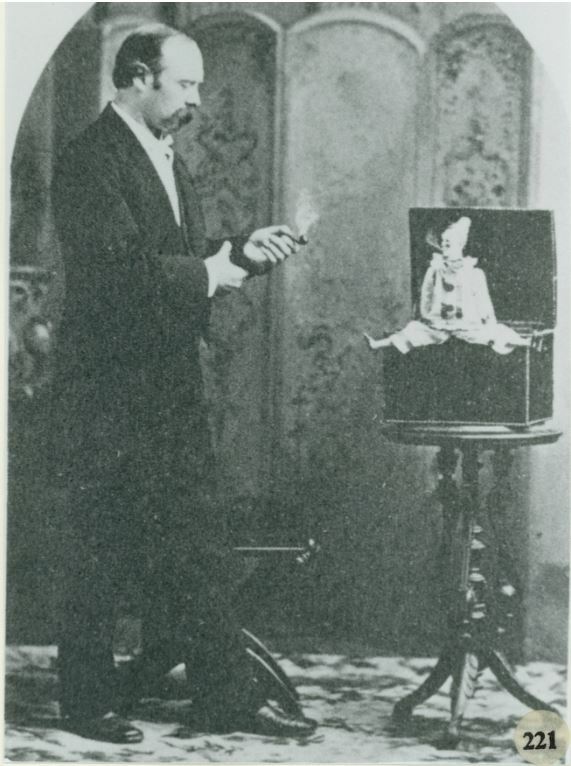 From 1869 to 1871, William Palmer as Robert Heller toured Australia and has been credited as the first person to perform a Punch and Judy show in Australia. Music wasn’t totally lost from his life as Robert played piano during his performances and his talent duly noted. Robert performed in Melbourne, Geelong, Ballarat, and even Smythesdale. It appears that’s as close as he went to Hamilton. “NEWS AND NOTES.” The Ballarat Star (Vic. : 1865 – 1924) 2 April 1870: 2. Web. 17 Sep 2017 . 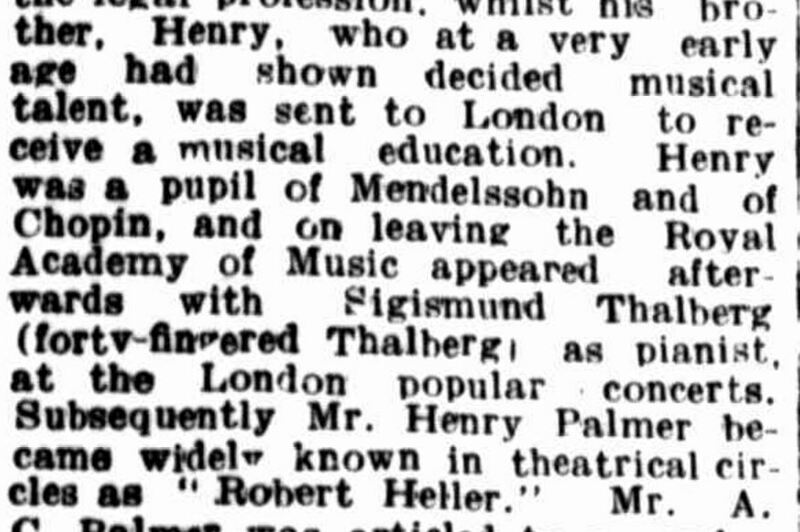 The Hamilton Spectator reported on Robert Heller from time to time but never mentioned his connection to Angelo Palmer. 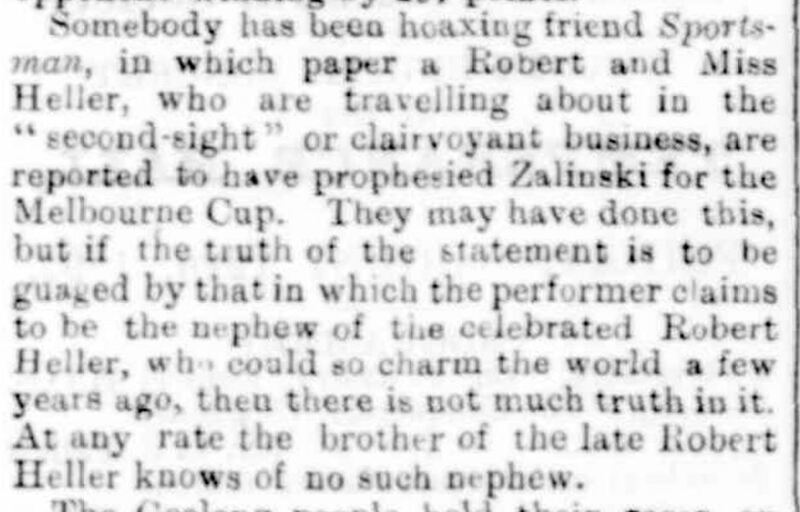 It was not until after the death of Robert Heller in Philadelphia in 1878, various papers made the connection, but not the Hamilton Spectator. William left a large estate and after various beneficiaries received a share, Angelo received the balance. “ITEMS OF GENERAL NEWS.” The Telegraph, St Kilda, Prahran and South Yarra Guardian (Vic. : 1866 – 1888) 1 February 1879: 3. Web. 15 Sep 2017 . “SPORTING ECHOES.” Hamilton Spectator (Vic. : 1870 – 1918) 9 August 1892: 4. Web. 15 Sep 2017 . Melbourne Punch responded and didn’t worry about naming names, even referring to Angelo as “Mr. Hamilton”. “THEATRICAL GOSSIP.” Melbourne Punch (Vic. : 1855 – 1900) 18 August 1892: 7. Web. 17 Sep 2017 . In 1907, Kate died at the age of sixty-six. Angelo continued living at the family home in Skene Street and was eighty when he died in 1912. He was buried at the Hamilton Old Cemetery (below) with Kate and beside his young daughters. GRAVE OF ANGELO PALMER AND FAMILY, HAMILTON OLD CEMETERY. It wasn’t until after Angelo’s death, the Hamilton Spectator spoke of the unspoken. 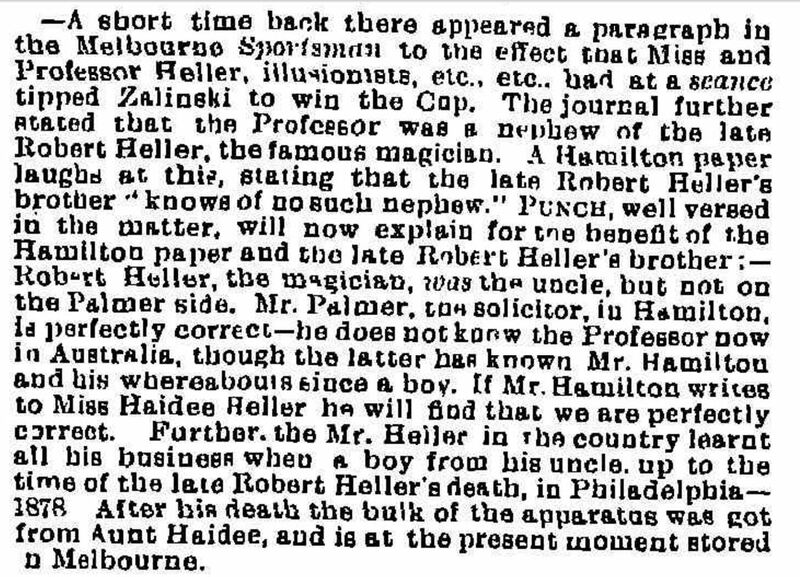 “DEATH OF MR. A.C. PALMER” Hamilton Spectator (Vic. : 1870 – 1918) 12 August 1912: 3. Web. 15 Sep 2017 <http://nla.gov.au/nla.news-article225284343&gt;. I have only given a broad description of William Palmer/Robert Heller’s life, but if you would like to find out more, the following sites will give you an idea of how big Robert Heller was in the world of magic and the influence he had on future magicians including Harry Houdini. The Cemetery Traveller includes photos of Robert Heller’s grave including a photo of Harry Houdini paying his respect. McARTHUR, Robert Ernest – Died 29 August 1929 at Terang. Robert McArthur was born in 1867, a son of Peter McArthur (see obituary above) and Margaret McLean. He attended school at Geelong College before studying law at Melbourne University. Qualified as a solicitor, Robert returned to Menengoort to help his father with the property. Robert had a great love of horses and was an amateur rider in cross-country events across the Western District, mostly for the Manifold brothers. In 1897 and 1898, Robert won three races in each year at Warrnambool’s Amateur races. He also had success at the Oaklands and Melbourne Hunt Clubs and participated in polo matches. In later years, Robert joined the committee of the Camperdown Turf Club and was an honourary starter for the Terang Racing Club and sat on the first board of the Western District Racing Association. 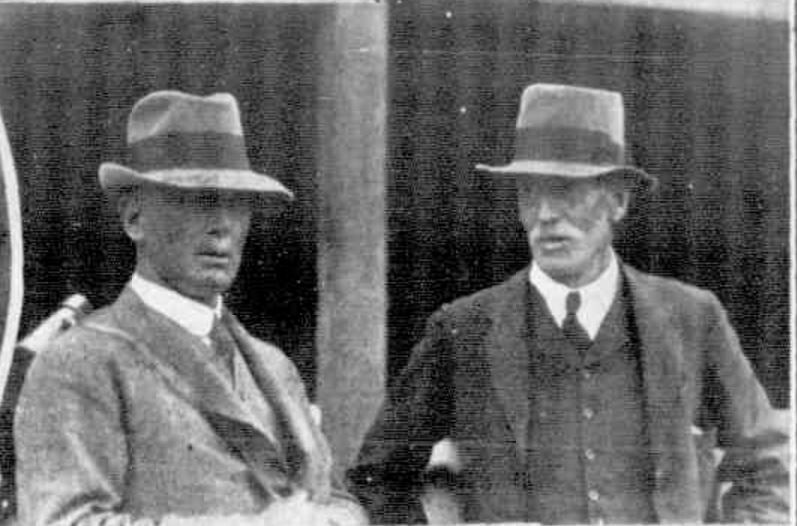 ROBERT McARTHUR (on right) -“CUP MEETING OF TERANG RACING CLUB, NEW YEAR’S DAY, 1921.” The Australasian (Melbourne, Vic. : 1864 – 1946) 8 January 1921: 41. Web. 15 Sep 2017 <http://nla.gov.au/nla.news-article140252424&gt;. Robert was also a Hampden Shire councilor from 1897 to 1907. In December 1898, Robert married Alice Edith Kirkpatrick. In his later years, Robert went to live at Koort-Koort-Nong Station. Robert McArthur was buried at the Camperdown Cemetery. GRANT, John Scott – Died 13 September 1879 at Sandford. John Scott Grant was born in Scotland around 1822. He married Ann Kilpatrick and they left for Victoria arriving in 1841 aboard the Grindlay. With a man named William Murray, John and Ann made their way west. 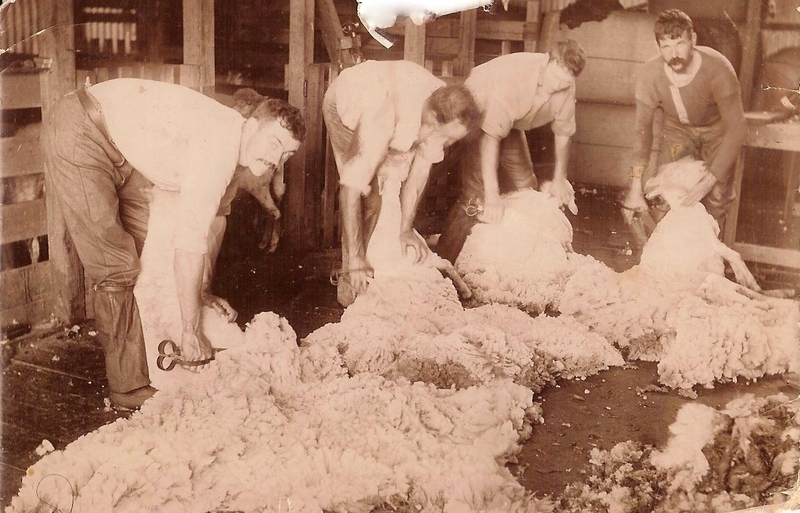 They first found work at the property of the Whyte brothers near Coleraine before John and Ann moved to Henty’s Merino Downs. John then took up a run near Penola, South Australia but by the early 1850s the lure of gold was too great and he headed to the diggings. It’s not known how his luck went, but after leaving the diggings, John sold his Penola property and bought the Woodford Inn at Dartmoor. He stayed there for around three years before purchasing land at Sandford in 1856 where he remained. 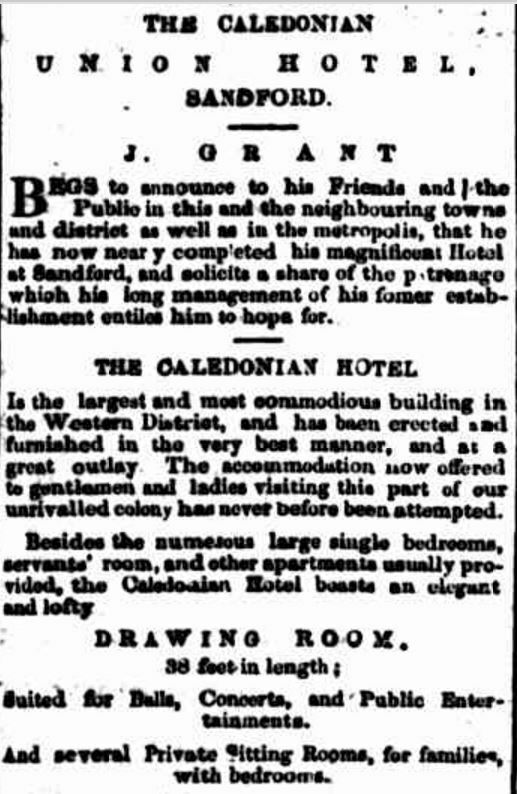 John built and operated the Caledonian Union Hotel at Sandford from 1857. “Advertising” Portland Guardian and Normanby General Advertiser (Vic. : 1842 – 1843; 1854 – 1876) 19 June 1857: 3 (EVENING). Web. 15 Sep 2017 <http://nla.gov.au/nla.news-article64568717&gt;. John’s obituary says of the two-story hotel as a”…rather pretentious building for those times”. A fire broke out at the hotel in 1871, damaging the second storey of the building. The Grants rebuilt but did not reinstate the second storey. Aside from the hotel, John was a member of the Ancient Order of Foresters. After John’s death, Ann continued on at the Caledonian Union Hotel until her death in March 1903. 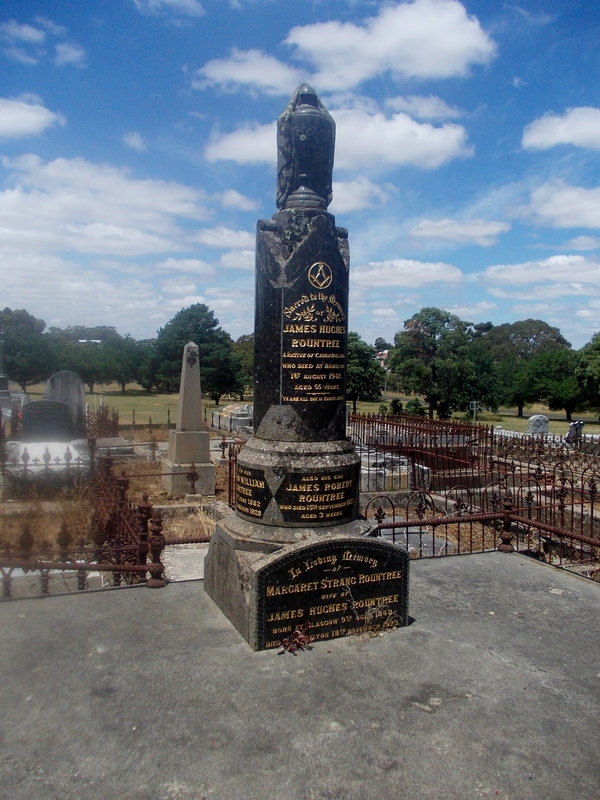 ANDREWS, Catherine Forbes – Died September 1901 at Hamilton. Catherine Andrews was born around 1834 and arrived in Australia in 1854 with her husband John Stewart. They settled at Naracoorte, remaining there for around ten years before John bought Bochara around 1865 and in 1868, the properties Inverary and Louth. The Stewarts lived at Inverary (below) near Branxholme, but when John died in 1882, Catherine moved to Hamilton where she remained until her death. DAVEY, Edith – Died September 1939 at Cobden. Edith Davey was born at Port Fairy in 1861. Her parents moved to the Port Campbell district and that’s where Edith remained for the duration of her life. 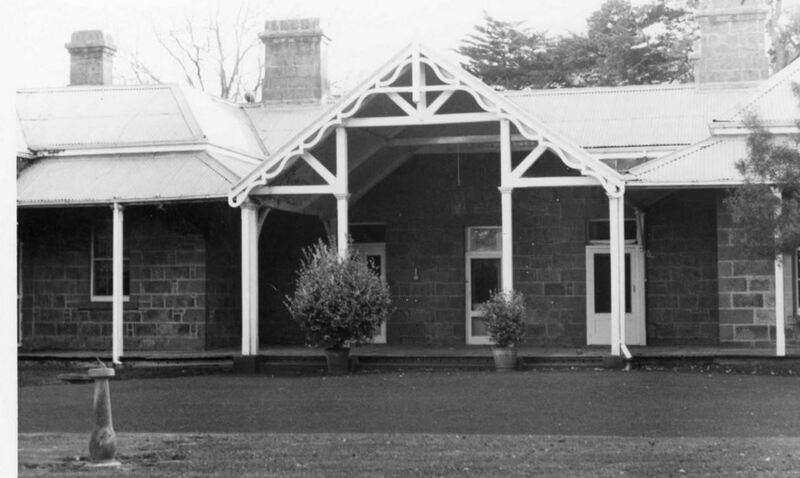 The Davey property was Edgecombe on the Great Ocean Road, just east of the Loch Ard Gorge. During August 1910, Edith’s sister Annie drowned in the property’s dam at the age of forty-seven and the following year her father died at the age of ninety and in 1915, her mother died aged eighty. Edith remained alone at the property for the next twenty-four years. 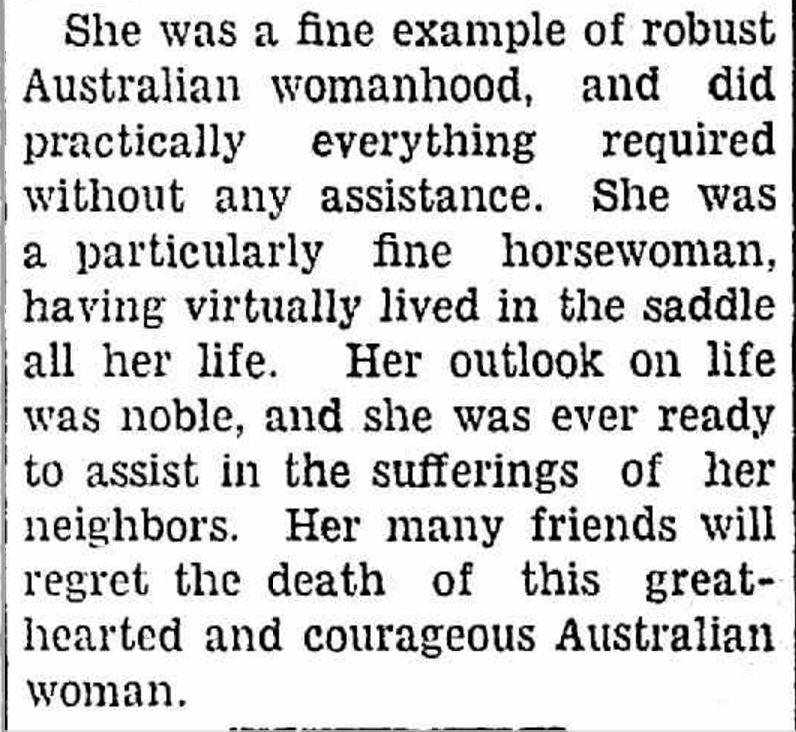 Her obituary in the Camperdown Chronicle described Edith as one of the “grand pioneer women of Australia”. 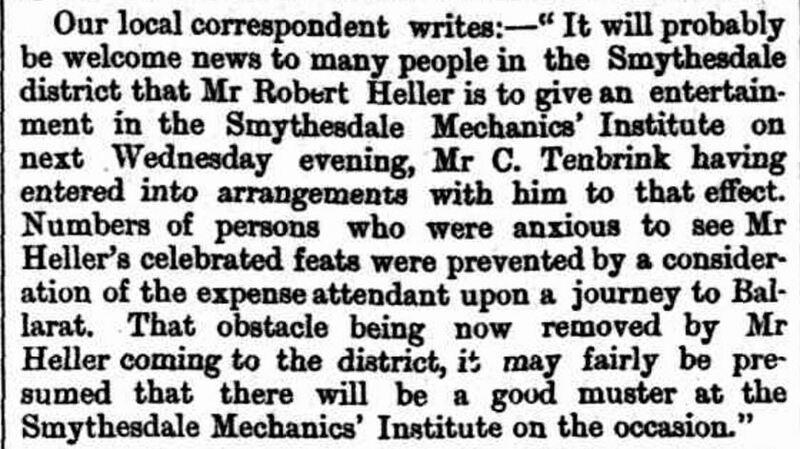 “MISS EDITH DAVEY” Camperdown Chronicle (Vic. : 1877 – 1954) 26 September 1939: 5. Web. 14 Sep 2017 . 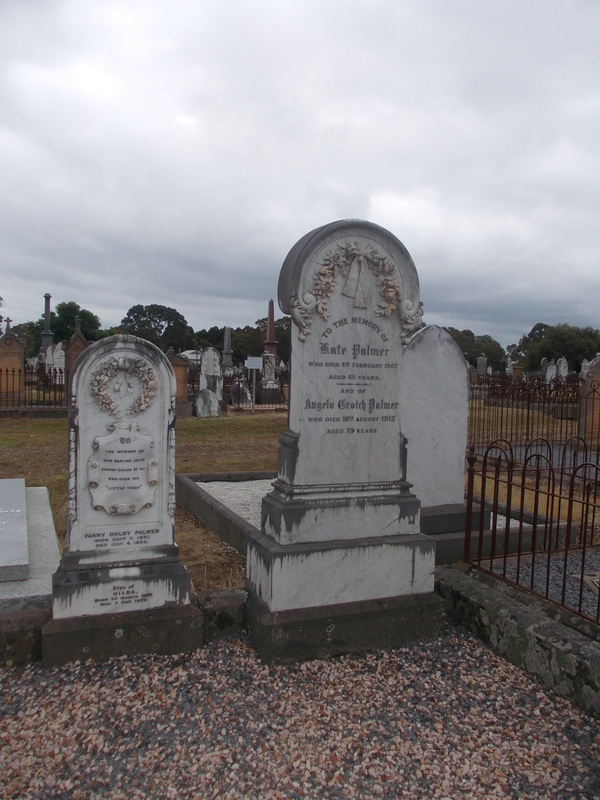 KIRKPATRICK, Alice Edith – Died 22 September 1952 at Melbourne. Alice Kirkpatrick was born at the Beemery Station near Bourke, N.S.W. in 1870. In 1898, Alice married Robert McArthur (see obituary above) and she moved to Victoria to live at Koort-Koort-Nong Station near Camperdown. Like her husband, Alice took an interest in racing and was a life member of the Terang Racing Club and Camperdown Turf Club. During WW1 she was secretary of the Camperdown Red Cross. Alice was also secretary of the Camperdown Golf Club Associates. In 1928, Alice and Robert went to live near Princetown but he died the following year. 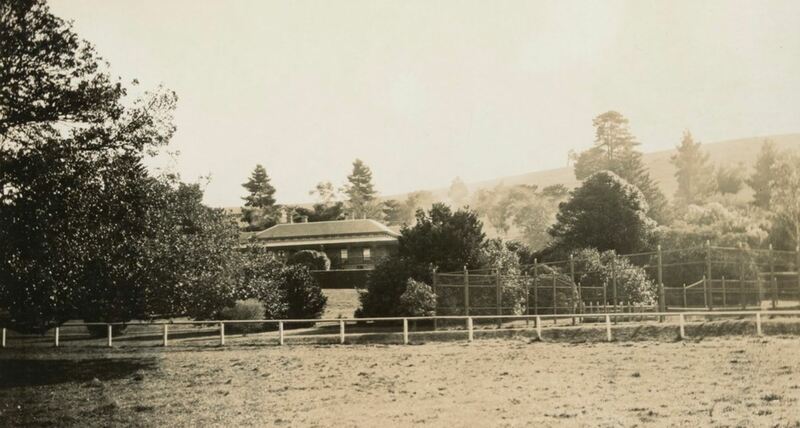 Alice remained at Princetown until around 1945 when she moved to Melbourne remaining there until her death.